Deep underneath Asia, the presence of a massive body of water has recently been inferred, between about 700 and 1,400 km below the surface (roughly in the middle of the mantle).1 This massive ‘seismic anomaly’, a segment of the mantle that attenuates seismic waves from earthquakes, was revealed by analyzing some 600,000 seismograms (graphic recordings of shock waves traveling through the interior of the planet). 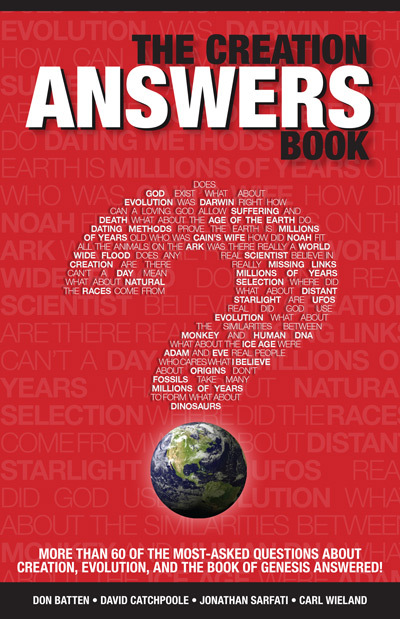 According to the discoverers (M.E. Wysession and J. Lawrence) the volume of water in this anomaly is at least that of the Arctic Ocean. The internal structure of the earth. Very little of the inner parts of the earth can be directly investigated. The deepest mine in the world (a gold mine in the Witwatersrand area in South Africa) descends 3.5 km into the lithosphere.2 The deepest that humans have ever drilled into the earth is on the Kola Peninsula in Russia, where drill core was retrieved from 12.26 km below the surface.3 From that point on to the centre of the planet, some 6,365 km, is all ‘unknown territory’. All we can do is to infer what could be down there from the limited data we have. In making such inferences, the first thing we know quite well is the mass of our planet, which was calculated by Henry Cavendish in 1789 using Newton’s laws. We can also estimate the average density of the uppermost ‘layer’ known as ‘crust’ or ‘lithosphere’ (from boreholes and from the rocks that outcrop on the surface). But how thick is the crust and what lies beneath it? This is where seismic investigation comes into play: shock waves (be it from earthquakes or explosions) have the ability to travel through the entire earth, and their speed changes according to the density of the environment they travel through. Oftentimes these waves undergo reflections and refractions whenever the speed changes. Based on these and many other derived characteristics, an image of the interior of the earth has emerged, suggesting a series of concentric spheres: the inner core, the outer core, the mantle and the crust. Runaway subduction may well be responsible for the water in the Beijing anomaly. The main characteristic distinguishing these regions is density, which, as a rule, increases with depth. Starting at slightly above 2 (the density of water is 1) at the surface, it is estimated to reach 11 in the core (which is believed to be made of nickel and iron). Each concentric sphere is separated from the previous one via a thin region at which the speed changes significantly; such a region is called a discontinuity. The Kola Peninsula superdeep borehole was designed to reach the Mohorovičić (’Moho’) discontinuity (named after the Croatian seismologist Andrjia Mohorovičić who discovered it) which at that point is situated at about 15 km down (the closest to the surface anywhere on land; under the oceans, which lack the uppermost layer of the lithosphere, the Moho rises in places to only 6 km below the seafloor). 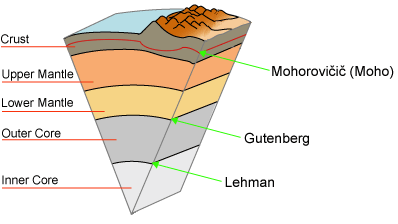 Other major discontinuities are Wiechert–Gutenberg (at 2,900 km) and Lehmann (at 5,100 to 5,200 km). Some major seismic discontinuities within the earth. The Catastrophic Plate Tectonics (CPT) model also provides a good creationist model for Noah’s Flood. According to it, when the first segments of the crust (seafloor) started sinking into the earth’s interior, they were moving meters per second rather than millimetres per year (the pace at which plates move today). At that speed, the sinking plates could have reached the bottom of the mantle (2,900 km below surface) in 15 days. Indeed, seismic tomography (a sort of CAT scan of the innards of the planet) provided evidence that there are colder-than-the-surroundings slabs of rock the size of continents at the bottom of the mantle which could not have been there for too long (otherwise they would have been totally melted and mixed beyond recognition with the mantle material). 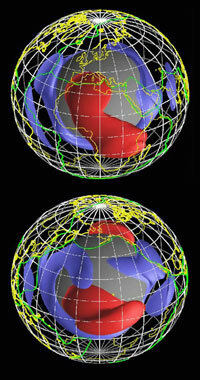 Mantle density structure of the eastern (top) and western (bottom) hemispheres derived from seismic tomography. Blue represents low temperature rock and red high temperature rock. Bright green contours represent present-day subduction areas. If tectonic plates were subducted at such a speed (‘runaway subduction’), sediments on the seafloor and massive amounts of water would have been dragged down with them. 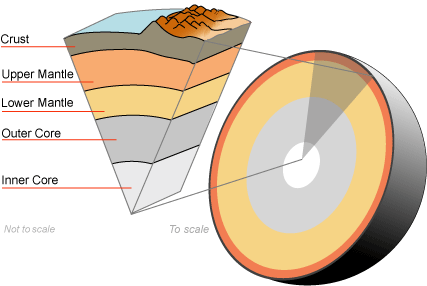 Once they reached the areas of high pressure and temperature inside the mantle, that water and the waterlogged sediments would have changed into very active chemical solutions and gases (sometimes referred to as volatiles) which, being significantly lighter, would tend to rise towards the surface. It is interesting that recent experiments have revealed that, when submitted to pressures and temperatures similar to those in the mantle, calcite (CaCO3 ), in the presence of iron, turns into methane gas.5 In light of this, a large and spectacular array of other similar chemical changes would be possible when vast volumes of seafloor rapidly sank into the mantle. At the slow pace subduction unfolds today, the seafloor melts as it descends and the volatiles separate early on, much closer to the surface. Consequently they will have different chemical characteristics and most of them reach the surface instead of remaining inside the mantle. Runaway subduction may well be responsible for the water in the Beijing anomaly. But even larger volumes of mineral-laden fluids (hydrothermal fluids) could have reached the upper mantle and the crust. Wherever they would have filtered through unbound sediments (and Noah’s Flood surely produced tremendous amounts of them) the dissolved minerals would precipitate, cementing the unbound sediments into hard rock. About 90% of all sedimentary rocks are considered to be ‘terrigenous’ i.e. made of fragments of previous rocks eroded away from the continents and bound together by chemical cements. The source of these chemical cements (their sheer volume is immense!) has long been a conundrum. Not anymore. The sediments deposited during Noah’s Flood contained massive vegetal debris and innumerable carcasses. The same hydrothermal fluids could have rapidly fossilized them (replacing the organic matter with mineral matter to varying degrees). Thus the whole of the known fossil record could have been formed in a short time. Such deep hydrothermal solutions are not known to be present on the surface now (all existing ones originated by infiltration of water from the surface to a depth no greater than a few kilometres), which would explain why widespread fossilization is not being witnessed today. The vast majority of the known fossils are the result of a unique geological process—Noah’s Flood—which the newly discovered Beijing anomaly seems to confirm. Fitzpatrick, T., 3-D seismic model of vast water reservoir revealed Earth mantle ‘ocean’, news-info.wustl.edu/news/page/normal/8222.html Return to Text. Johnson, R.A., Geotechnical classification of deep and ultra-deep Witwatersrand mining areas, South Africa, Mineralium Deposita 32:335–348, 1997; . www.csir.co.za/publications/schweitzer_1997.pdf Return to Text. Analysis of log and seismic data from the world’s deepest Kola Borehole, http://asuwlink.uwyo.edu/~seismic/kola/ Return to Text. Baumgardner, J., Catastrophic plate tectonics: the geophysical context of the Genesis Flood, Journal of Creation 16:58–63, 2002; www.creation.com/article/1596 Return to Text. Rennie, G., The search for methane in Earth’s mantle, S &TR, Lawrence Livermore National Laboratory, pp. 21–23, July/August 2005; www.llnl.gov/str/JulAug05/pdfs/07_05.3.pdf Return to Text.